Chablis is a town and commune in the Yonne department in Burgundy in north-central France. 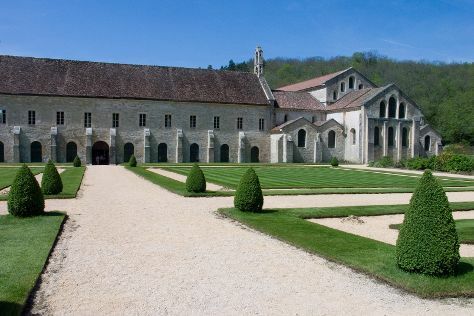 Explore Chablis' surroundings by going to Abbaye de Fontenay (in Montbard), Grande forge de Buffon (in Buffon) and Tresor de Vix - Musee du Pays Chatillonnais (in Chatillon-sur-Seine). There's lots more to do: don't miss a visit to Chateau Ancy-le Franc, examine the collection at MuseoParc Alesia, take an in-depth tour of Mémorial Charles De Gaulle, and Head underground at Grottes d'Arcy-sur-Cure. For reviews, traveler tips, photos, and more tourist information, use the Chablis trip itinerary website . If you are flying in from United States, the closest major airports are Paris-Orly Airport, Charles de Gaulle International Airport and Dole-Tavaux Airport. In April, daily temperatures in Chablis can reach 61°F, while at night they dip to 41°F. Wrap up your sightseeing on the 2nd (Sat) to allow time to travel back home.